President Trump Is Back To Playing On Grievance To Fire Up His Base After Health After six months of no major legislative achievements and amid sliding poll numbers, President Trump is working to keep his loyal supporters behind him with a return to the culture wars. "Trump has been under siege since he took office," said Brian Jones, a Republican political consultant and veteran of several presidential campaigns, "and the cumulative effect of his administration's missteps is an eroding approval rating, even among Republicans." So Trump's team is rolling the dice, betting that if he can't get something done through the usual avenues in Washington, he can at least keep his supporters outside of it fired up with a dose of the cultural grievances that helped get him elected. When a president's back is up against the wall, what he has got left is his base. He can't afford to lose his most ardent supporters, so, often, presidents go back to the embers they stoked to fire up those supporters in the first place — be they cultural or economic. On Wednesday, the Trump White House backed a hard-line immigration proposal that would significantly curtail legal immigration. The move came less than a week after the Senate health care bill went up in smoke — and on the heels of some other culture war moves from the president. Trump tweeted a call for a ban on transgender people in the military; the Justice Department put up a personnel posting to staff an effort to sue over racial discrimination against Asian-Americans in university admissions; and Trump suggested in a speech to police that they shouldn't be "too nice" to certain suspects. That is all red meat for his base — issues that have historically played to white grievance. Out of the hot focus of the legislative and Russia investigation headlines, many of these issues have been there since the start of the Trump presidency. One of his first major efforts was the travel ban that targets people from six (originally seven) majority-Muslim countries. And the Justice Department is working to try to cut off funding to so-called sanctuary cities, as well as urging prosecutors to seek the toughest sentences possible for nonviolent drug offenders, reversing Obama-era policy. "I assume they're doing it because these are policies that the president believes will 'make America great again,' " said Alex Conant, a former Republican National Committee spokesman and veteran political operative who worked for Sen. Marco Rubio's presidential campaign, in a reference to Trump's campaign slogan. "Politically, it could help him maintain a floor as his poll numbers continue to slide." Trump received the worst numbers of his presidency this week. A Quinnipiac poll had the president at just a 33 percent approval rating with Republican support slipping. "Speak English," the president and Sen. Tom Cotton, R-Ark., one of the sponsors of the immigration legislation, said was one of their requirements for those who want to come to the United States. They also said these new — legal — immigrants will have to have skills that could help the economy and have to be able to financially support themselves. When confronted with the poem at the Statue of Liberty about welcoming the tired, huddled masses, White House policy adviser Stephen Miller told reporters, "The poem that you're referring to — that was added later — is not actually a part of the original Statue of Liberty." The poem that you're referring to — that was added later — is not actually a part of the original Statue of Liberty." Stephen Miller, White House policy adviser, on the Emma Lazarus poem at the Statue of Liberty that talks about "huddled masses"
The poem — The New Colossus by Emma Lazarus — was added in 1903, 17 years after Lady Liberty was dedicated. It was written by Lazarus 20 years earlier as part of a fundraiser for the statue. Lazarus was the daughter of a wealthy sugar-refining family but was taken with the plight of the immigrants and refugees with whom she worked. Her poem depicts the Statue of Liberty as the "Mother of Exiles." Lazarus' story and poem are featured by the National Park Service on its Statue of Liberty website. The American immigration story for many, if not most, is one of people coming to the U.S. with little more than the clothes on their backs "yearning to breathe free." Many are escaping poverty or war or simply seeking a better life, a chance to live a middle-class existence for themselves and their children. It's the quintessential American Dream, that anyone can make it in the U.S. The Trump administration argues that it is backing the legislation because it would be good for American jobs, especially for minorities already in the country, who cannot find work. 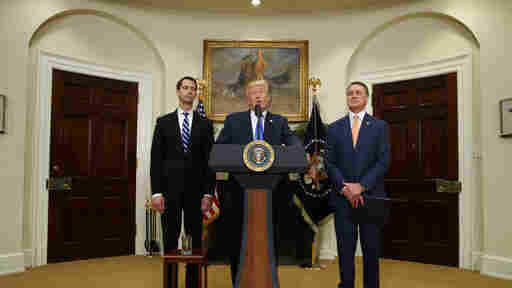 "Among those hit the hardest in recent years have been immigrants and, very importantly, minority workers competing for jobs against brand-new arrivals," Trump said Wednesday in announcing his support for the bill. "And it has not been fair to our people, to our citizens, to our workers." That sentiment is real. Anecdotally, low-skilled laborers have traditionally been prone to skepticism toward new immigrants, who can be paid less. Businesses argue that Americans won't take the more dangerous, laborious work. "Economists disagree whether or how much an influx of immigrants depresses wages. Some have found that new immigrants depress wages for certain groups, such as teenagers or workers with a high school diploma or less. Others say the overall effect on the economy is tiny, and an influx of immigrant workers vitalizes the economy overall." "According to some experts, the flood of Hispanic immigrant workers in the past 25 years — both legal and illegal — has had a much smaller effect on employment patterns than other trends, including factory flight overseas, weakened labor unions and a spate of recessions. "They also say that low-skilled immigration has been both a boon and a burden to America. It has squeezed public services but generated tax revenue. It has depressed wages in some areas but has revitalized ailing communities. The group that suffers most from the influx of new foreign laborers, these experts report, are earlier immigrants." It's not just the immigration push that is proving divisive. So are the other recent controversial, culturally focused steps taken by the administration. The Justice Department says its affirmative-action effort is about "racial discrimination against Asian-Americans," according to a spokeswoman, who added that the department "is committed to protecting all Americans from all forms of illegal race-based discrimination." "Maybe now people will finally pay attention to something we Asian-Americans have been talking about for so long," Joe Zhou told the Los Angeles Times. Zhou sued Harvard in 2015 on behalf of his son, who did not get in despite being a valedictorian with a 4.44 grade-point average, near-perfect SATs and involvement in extracurricular activities. But not all Asian-Americans feel that way. The advocacy group Asian Americans Advancing Justice condemned the Trump administration's move and said it supports affirmative-action policies. "Affirmative action expands educational opportunities for all applicants in a society where cultural and racial biases in testing and access to quality education deny many students equal opportunity," the group wrote in a statement. Instead of attacking affirmative action programs, the Trump administration should use its platform to increase opportunities for all students." It noted that affirmative-action policies particularly help "low-income and working-class Asian-Americans and Pacific Islanders." Civil rights groups say affirmative-action opponents often focus on Asian-Americans for these kinds of cases as part of an effort to weaken affirmative-action policies more broadly. "Since the new administration has been in office, it has been moving very deliberately to operationalize its nativist agenda with policies like this one," Advancing Justice continued. "Instead of attacking affirmative action programs, the Trump administration should use its platform to increase opportunities for all students while continuing to address the persistent equity gaps for low-income students and students of color. We support affirmative action and refuse to allow Asian Americans to be used as a wedge between communities of color." Cornell William Brooks, the former head of the NAACP, said on CNN Wednesday that the Justice Department was looking for "ideological victims" and "racial bogeymen" that don't exist. That is part of why Trump's efforts convince racial and ethnic minorities that legal immigration hurts them doesn't appear to have made a dent. These things are always a matter of priorities. Trump's attempts to win over minority communities have often fallen short. "What the hell do you have to lose?" he asked in comments aimed at black voters — at a campaign rally delivered to a largely white crowd in Michigan. Trump wound up winning just 8 percent of black voters in 2016, less than George W. Bush in 2000 and 2004 and barely more than Mitt Romney in 2012. In reality, those appeals were also largely aimed at trying to keep the GOP voting bloc together, part of an effort to make Trump appear open-minded to white, suburban Republicans. The impending ban on transgender people serving in the military, which Trump announced via Twitter, caught Pentagon leaders off guard. Some seemed none-too-pleased with it — and appear to be breaking ranks with their commander in chief. Coast Guard Commandant Adm. Paul Zukunft told a transgender service member, for example, that he "will not break faith." Joint Chiefs of Staff Chairman Joseph Dunford issued a statement saying, "There will be no modifications to the current policy until the President's direction has been received by the secretary of defense and the secretary has issued implementation guidance." The immigration legislation has little chance of passing in Congress. It doesn't have the support of 50 Republican senators, let alone the 60 total votes in the Senate needed to overcome a filibuster. Narratives of health care failure and Russia investigations have dominated headlines and cable news over the past couple of months. And Trump's numbers have suffered because of it. "Lower than Obama received during his entire presidency..."
These are historically bad numbers for a president. No one has been this low at the same time since polling began. But, in fairness, Trump also had historically bad numbers for any major-party nominee — and still won the presidency. That is important to remember, but it certainly didn't matter in the election and it's not everything now. The actions the White House is taking and the issues the administration is pushing signal worries among the president's political team. "Looking at this through a political lens," Jones said. "It appears these coordinated announcements are an effort to keep his core supporters engaged and on board the Trump train." There are signs of bumpiness on the tracks. Trump won independents in 2016, but a late June NPR/PBS NewsHour/Marist poll found his net approval among them had fallen 17 points since February. His base, however, appeared intact. That may be changing. Traditionally, even in the worst of times, presidents retain very high support among their party. But Quinnipiac found a softening, a 10-point drop since June among Republicans saying they "very strongly" approve of the president. Barely a majority of Republicans said they "strongly approved," 53 percent, down from 63 percent two months ago. "The trend is worrisome," Conant said. Trump has begun distancing himself from congressional Republicans, referring to them as "they" and publicly shaming them for having promised action on health care for seven years. But there is only so long a president can position himself as the "outsider." President Obama certainly tried. He ran a re-election campaign partially on it. Trump is at least now partly responsible for the legislative push — and for making the argument for policies. That is something he has failed to do effectively. On health care, for example, he never got beyond boilerplate political talking points to engage the public with any depth on the nuts and bolts of policy. Yes, health care is complicated. Obama was steeped in policy, and on many issues, especially health care, he was his administration's best spokesman. But when there were failures, just like Trump, Obama blamed "Congress," all of Congress. That infuriated his own party. "The most important lesson I've learned, is that you can't change Washington from the inside," Obama said in September 2012, two months before winning re-election. "You can only change it from the outside." For Trump, the blameless posture is complicated by the deal-maker persona he has created for himself. He wrote a book about it. Trump has pledged to make the "best" deals. So far, though, he has dealt only with Republicans, making no serious push to bring Democrats on board. At this point, he is only at the threatening stage with Democrats. Maybe that shouldn't be surprising, however, considering how Trump advocates making deals in The Art of the Deal. In one section, he imagines how he would have responded to a hostile takeover attempt that played out in a different company. "I'm not saying I would also have won, but if I went down, it would have been kicking and screaming," he wrote. "I would have closed the hotel and let it rot. That's just my makeup. I fight when I feel I'm getting screwed, even if it's costly and difficult and highly risky." "As I said from the beginning, let ObamaCare implode, then deal. Watch!" "Time to force the conversation"
The White House seems to see this culture push as good politics. In the briefing room with reporters, Miller, for example, called the immigration legislation "enormously advantageous" and said it was "time to force the conversation on this issue." He even explicitly mentioned "battleground states." "Public support is so immense on this," Miller contended. "If you just look at the polling data in many key battleground states across the country — that over time you're going to see massive public push for this kind of legislation." "This forces Democrats in Rust Belt states like Ohio, Michigan, and Wisconsin, to take complete ownership of this issue. How will the blue-collar voters in these states respond when senators up for re-election in 2018 like Debbie Stabenow are forced to make their opposition to this a key plank of their campaigns?" Some Republicans worry reviving the culture wars is the wrong place to focus to achieve the outcome this White House is looking for. But, White House press secretary Sarah Huckabee Sanders disputed there were any electoral calculations behind the ban. Asked on July 26 whether the decision had anything to do with trying to put pressure on Democrats in battleground seats, she said, "Not that I'm aware." She said it was all about "military readiness and unit cohesion." A different official also told The Washington Post that the decision was about "military readiness and military resource decision," but added, "It will be fun to watch some of them [Democrats] have to defend this, but that was never an impetus." "The challenge is for every political action, there is an equal and opposite reaction," Jones said, "and I think many Main Street Republicans, let alone independents, will bristle at proposals they consider to be exceptionally exclusionary particularly in the absence of addressing issues that traditionally animate the whole party, like tax reform." An earlier version of this story incorrectly said President Trump's approval had slipped 17 points among independents since February. His approval dropped 9 points, part of a 17-point swing. Previously corrected on Aug. 5: A version of this story incorrectly said Donald Trump asked black voters: "What the hell do you have to lose?" at a Wisconsin rally. He actually said this at a Michigan event.